It is true that there are no permanent enemies or permanent friends in politics. But this Machiavellian law is clearly not applicable when a coalition of parties is in the midst of an existential battle. No one can grudge the Congress partys desire to revive, but fighting the main enemy, in this case the BJP, and at the same time firing lethal rounds at allies has created bad blood among coalition partners. Mayawati, Akhilesh Yadav and Ajit Singh (BSP, SP, RLD) have spoken out in unison: "There is no difference between the Congress and the BJP." The other day "Gathbandhan" was in a huddle, counting the number of seats where the Congress has entered the fray "as a spoiler". In Saharanpur, Kheri, Badaun, Sant Kabir Nagar, Sitapur, Bijnor and so on - the Congress is helping not the "gathbandhan" but the BJP. Why is the Congress in this mode of double containment? 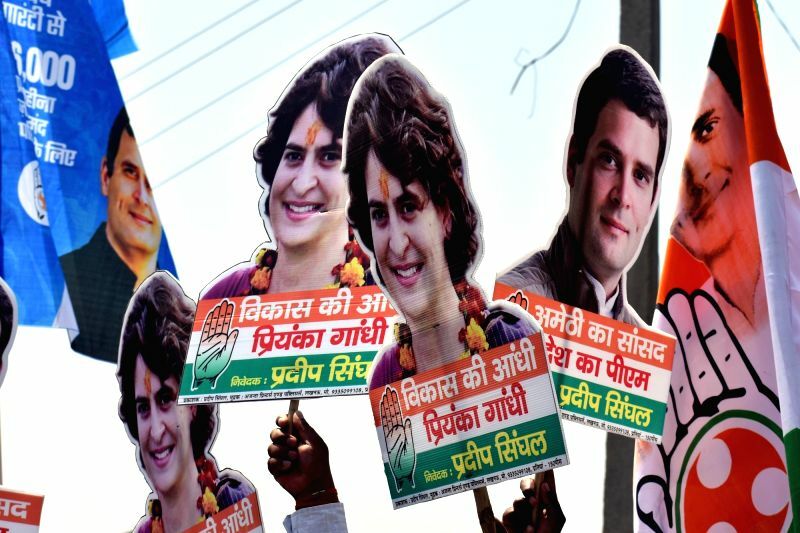 One does not have to look far for hints and guesses: Priyanka Gandhi has, in so many words, clarified her party's intention. "We are preparing the ground for 2022" - the Assembly elections. In other words, for the Nehru-Gandhi parivar, the 2019 Lok Sabha elections are not a matter of life and death. Will Narendra Modi return signal the end of democracy, usher in fascism and worse? The Congress is not taken in by such alarmist nonsense. The Congress has not been able to properly market some of its smart, double edged moves. Fielding Rahul from Wayanad in Kerala has been criticized for the obvious reason: that Wayanad is a seat from where the Congress always wins. The unnecessary insertion of the Congress President in the battle has signalled the party's antipathy towards the Left with which it had been in conversation for some co-ordination in West Bengal. The Wayanad episode came on the heels of the West Bengal arrangement being spurned by the Congress. The coincidence amplified Congress ambivalence, its inability to decide whether it should strengthen the opposition or weaken regional forces. It probably feels that it looks relatively more muscular for future battles by undoing its own allies. What the Congress has not marketed is this: Rahul from Wayanad may block Congress candidates fleeing towards the BJP which is aching to open its account in Kerala. Also, the intellectual pool around the Congress President appears to have been influenced by the pro-Modi media which has projected 2019 as a Presidential contest. This is not new. During the 2014 elections, Arnab Goswami, as the oracle and arbiter of national destiny, was on the same trajectory. He attempted to lure Rahul Gandhi into his parlour for a Modi-Rahul debate. It did not work out because Rahul Gandhi was dreaming dreams of building the party brick by brick, village Panchayat upwards, a high pyramid with a wide base. In fact Rahul Gandhi had brought in a former Election Commissioner K.J. Rao to organize a system of primaries for election to the Youth Congress and National Students Union of India. He sought expert help to select 16 untainted Lok Sabha candidates as a sort of pilot project. At this speed, one wondered, how long will it take Rahul Gandhi to identify 543 Lok Sabha candidates? What is the reason that the 2004 to 2009 was possibly the cleaner innings that Manmohan Singh played? One reason is that he had outside support of 60 Left Front members who enabled the Congress to keep the riff raff at bay. True they had ideological objections to the nuclear deal with the US, but corruption was nowhere in the vicinity of that arrangement. Fierce rightwing pressure resulted in the Left's departure. The replacement of the Left by greedy interests opened the floodgates of corruption on a scale that Modi, backed by the world's most expensive campaign, harnessed to his dramatic advantage. Very few in the Congress remember: after the Party turned its back on the Left, it came down to its lowest ever tally - 44 seats. I have already dwelt on Rahul Gandhi's diffidence on the eve of 2014 elections when his party had its best score in two decades - 209 seats. And now with merely 44 under his belt, is it realistic to expect him to bust his guts for the ultimate trophy? Not surprising, therefore, that in the space of a month both Rahul Gandhi and Priyanka Gandhi have publicly backtracked. They have both said separately that they are preparing the ground, particularly in Uttar Pradesh, for 2022. Partymen are thinking of 2024 Lok Sabha elections. In striking this posture, they miss the basic point. Election 2019 was supposed to focus on bringing down the BJP. The frontpage photographs on May 23, 2018 in Bengaluru and January 19, 2019 in Kolkata of the Mahagathbandhan represented a United Front against the BJP. Once this mission was accomplished, the coalition would get into a huddle to select the leader of the House. If the results are more or less even, this would, for the BJP be an excellent election to lose. The Ram Temple remains unbuilt. Kashmir and the Pakistan cauldrons are bubbling over. On each one of these issues, the B team of the BJP, namely the Congress, will simply wilt. Pakistan Prime Minister Imran Khan was succinct: chances of an Indo-Pakistan dialogue are more likely in the event of Modi winning, because a weak opposition government would be too much in a state of funk to go against the current of anti-Pakistan nationalism. Much of this is highly speculative. Should the BJP numbers fall just enough to qualify it for the largest single party status, Naveen Patnaik, K. Chandrashekar Rao, Jaganmohan Reddy in Odisha, Telengana and Andhra Pradesh will be inclined to leap from their fence but only on their terms which will most certainly include a change of leadership in the BJP.